The Michael Kors Access Runway. And the Skagen Falster 2. The Diesel On Full Guard 2.5. The Fossil Q Venture HR and Q Explorist HR. Oh and don’t forget the Emporio Armani Connected 2018. Fossil Group is by far the biggest thing in wearable tech at the IFA tech expo in Berlin this year. The watch and accessories maker is at the show with its latest batch of designer Wear OS smartwatches. All of them have been treated to a substantial features upgrade in the form of smartwatch payments, built-in GPS, heart rate tracking and waterproof design. We haven’t reviewed any of this new cohort yet – we’re now in possession of a Fossil Q Venture HR and Fossil Q Explorist HR (above) and getting hands on time with the rest – but it also looks like designer heritage and wrist style haven’t been sacrificed either. One caveat – full-fat smartwatches still need to be less, well, fat. 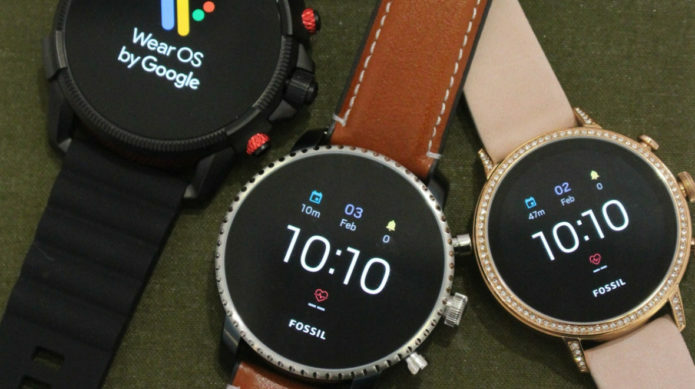 Fossil Group has made that a priority for its hybrids but doesn’t seem to be making the same kind of progress when it comes to Wear OS watches. They are still noticeably thicker than their ‘dumb’ design inspirations. Still, take the Skagen Falster 2 (below). The smallest size of the Samsung Galaxy Watch is 42mm yet Skagen has squeezed pretty much all the same components into a 40mm watch. And there’s only minor tweaks to the minimalist design to get that swim-proof 3 ATM waterproofing. 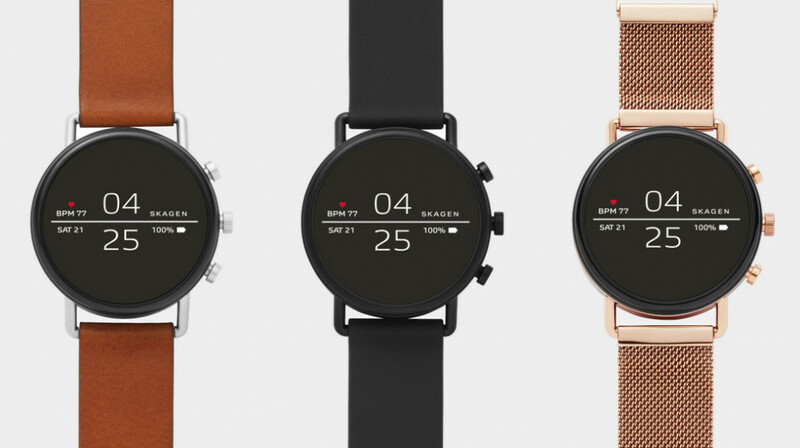 These upcoming designer watches have also been given a boost by Google’s onslaught of upgrades to the smartwatch operating system they all run. Wear OS is getting a new smart assistant and notification stream that’s better designed for glanceable wrist wear via a September OTA update and Google Fit just got its first major shake-up since 2014 with Move Minutes and Heart Points. So Wear OS is improving but the Group is also showing that it’s not afraid to go out and make its own partnerships to fill the gaps. Fossil the brand has teamed up with a personal safety startup called Noonlight to roll out its software to new Gen 4 watches like the Q Explorist HR and Q Venture HR in the US. We’d like to see this move across to the other designer brands too. So can Fossil and friends rest on their laurels? Well, no this is technology darlings and tech moves faster than fashion. The Samsung Galaxy Watch, as boring an upgrade as some of us found it, offers four days battery life on the 42mm model and a goddamn week for the 46mm watch. Fossil Group has gone ahead and launched its new Fall/Winter collections with the same Qualcomm Snapdragon 2100 chips whereas we might soon see smartwatches with more powerful, and battery saving, processors. Battery life should be Fossil Group’s next big concern – those hybrids are lovely but won’t do for everyone – and LTE might be worth exploring too considering it’s done well for Apple. Speaking of, the Apple Watch Series 4 is – we assume – mere weeks away (if the September announcement ritual holds) and while we’re not expecting anything as big as the addition of LTE, there’s plenty of exciting rumours as to what we can expect. Fossil Group designer smartwatches don’t necessarily need to match Apple and Samsung on every tech-y feature but by 2019, they may have broadly caught up on specs while still being ahead on design and style. With Google’s on the same team, is fashion beating tech at its own game?